I do not actually buy a lot of books. When you're a librarian, you don't always need to. We are surrounded by free books. But when I started updating our grade level book lists to get ready for Summer Reading, I was hearing a lot of buzz for this title and I wasn't going to be able to get a library copy in before I needed to have the updates done. So I bought it. Be Prepared by Vera Brosgol gave me the feels. Like, so much that I actually had to put it down at one point and come back to it the next day. And I dreamed about summer camp. Almost-10-year-old Vera is on the outside a lot. Although she gets invited to slumber parties with the other girls, she's never really part of the in-crowd. And when she tries to throw her own birthday slumber party, things go horribly awry. Vera always feels different than the other kids and part of that is because, as Russian immigrants, her family is different. Which is why, when Vera hears about a Russian culture summer camp sponsored by her church, she is desperate to go. All the kids in her neighborhood disappear to go to various camps in the summer and Vera's sure she's finally found a place where she will really fit in. But camp is not at all what Vera expected. She's put into a tent with two girls who are best friends and who are much older than her. There's no running water, which means using a disgusting outhouse for two weeks, and Vera can't seem to do anything right. Having no friends at camp is even worse than having no friends at home because at home at least a bear's not going to eat you. And you have toilets. This story is based on author Vera Brosgol's actual experiences and she definitely captures that feeling of being on the outside. What strikes me about this book is that it's so raw and real; Vera makes some bad decisions and some cruel decisions sometimes. Even though she knows how it feels to be the odd one out, she still is sometimes mean to some of the other kids. When you're growing up and you're figuring things out, you don't always make the right decisions and Brosgol doesn't shy away from that. Camp is made out to be this idyllic experience that everyone looks back on with nostalgia and longing. And it's not that way for everyone! I was one of those kids who went to camp and did not have an amazing time. I had a fine time, it wasn't torture every minutes, but given the choice I did not elect to go back. So I definitely identified with Vera. So, yes. Go get this book. Add it to your Summer Reading lists. I think it'll be a hit with kids. 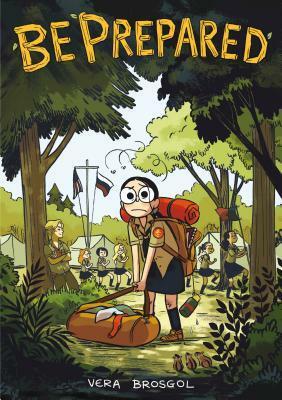 This is another great entry into the Children's Graphic Novel Memoir category, so kids who enjoy books like Raina Telgemeier's Smile, Jennifer Holm's Sunny Side Up or Cece Bell's El Deafo will also enjoy this one. Don't miss Vera Brosgol's fiction graphic novel Anya's Ghost, which is also great. Be Prepared by Vera Brosgol. Grades 4-7. First Second, April 2018. 256 pages. Review copy purchased (!! ).